Can we get to Mars using existing rockets? With the delays in SDLV and possibly no budgeting, can we use existing launch vehicles without major upgrades to design, launch, and assemble in space, vehicles and equipment to get to Mars? If so, what launch vehicles? and how do you think we could do it? Re: Can we get to Mars using existing rockets? Yes, we can. But we'd need some upgrades at least for some larger fairings (though not strictly necessary if you have a deployable heat shield of some kind) and higher launch rates would require some upgrades of launch facilities, though that can just come out of the usual $5000-$10,000 per kg to LEO cost of launch (which could/would be lower, perhaps as low as $2500/kg to LEO or lower for launching hundreds of tons of propellant to LEO per year). Operating the current facilities with 3 shifts (instead of just one) a day would help a lot in some areas without really any capital expenditures. I have a feeling some upgrades, like ACES upper stages and Falcon 9 Heavy would be worth it, though, too. And if we go with an all-chemical cryogenic propulsion system, we'd need to develop some near-zero-boiloff technology. It'd be possible to do with hypergolics, but the higher Isp (and thus lower IMLEO) of hydrolox would make a lot of sense. And using solar electric would be a good possibility, too, allowing a very large reduction in IMLEO (and launch rates). It could definitely be done, provided we do on-orbit refueling (currently done on ISS) and some orbital assembly (of far less complexity than done for ISS). EDIT:Also, it's probably necessary for the ascent vehicle to be fueled with ISRU propellant on the surface of Mars. Low Mars Orbit rendezvous will also be necessary. On-orbit refueling at both LEO and L1 or L2 would also probably be part of the architecture, perhaps even refueling at a pre-placed depot in low Mars orbit (LMO). Pre-placing the depots via solar-electric propulsion (SEP) tugs would allow many of the benefits but few of the draw-backs of SEP to be included in the architecture with less investment and less technology risk than a full SEP Mars transfer vehicle (MTV), though a SEP MTV would allow a significantly shorter overall mission length than a chemical MTV would allow. You could do a very capable mars mission using modest updates of existing rockets (EELVs). The key technology to make this possible is propellant depots. To get to mars, you would need a propellant depot in LEO and one at EML2. For better economics, you would need an ISRU fueled propellant depot at phobos. See this paper from ULA on how this would work link. It deals mostly with a moon mission with similar capability to the (canceled) constellation mission architecture. But a EML2 depot is also an excellent staging point for interplanetary exploration. Here is a paper on how to get started with propellant depots using existing tankage (from centaur) link. Sure we can do it with current launchers . Just like playing Civilization. Send up what you are going to send to Mars in pieces. * Send up power modules, life-support, habitation modules, fuel, engines. With the delays in SDLV and possibly no budgeting, can we use existing launch vehicles without major upgrades to design, launch, and assemble in space, vehicles and equipment to get to Mars? It'll probably just transfer the cost elsewhere. A fully-fueled lunar module would have enough delta-v (but not quite enough thrust) to function as a Martian ascent vehicle (or, actually, a Martian fully-propulsive descent vehicle, though not both on the same tank). So, if you fuel up the lander in low Mars orbit (or pre-place it fully fueled via a slow, long trip via SEP tug from LEO to LMO then rendezvous with it in LMO) and then fuel it up with fuel produced (or, more expensive, pre-placed) on the surface of Mars, then you have solved the two parts of the problem that are "not there yet" with current or near-term practice (Entry-descent-landing with enough mass for an ascent from Martian surface to Martian orbit). A Salyut-sized vehicle is adequate for an MTV and would wait for the crew in LMO while the crew is on the surface). The other issue is astronaut health, mainly bone structure and radiation. Radiation can be mostly addressed with either going during solar minimum (a difficult constraint on mission planning) or having enough shielding to block solar radiation (galactic radiation isn't fun and is very, very difficult to shield, but it's much less intense than solar radiation). Both the bone density and radiation problems could be addressed significantly with drugs, something that we should be putting a LOT more emphasis on for research aboard the International Space Station right now, since a cure (or near-cure, good enough for the mission) for both effects would probably reduce the cost of a Mars mission literally by half or more. This is very, very important because reducing the mass overhead of humans is essential for making human spaceflight sustainable, and ultimately making the expansion of humans into the cosmos possible. Otherwise, we'll have to be content with unmanned space exploration. It'd be possible to do with hypergolics, but the higher Isp (and thus lower IMLEO) of hydrolox would make a lot of sense. And using solar electric would be a good possibility, too, allowing a very large reduction in IMLEO (and launch rates). Hypergolics (or other storable propellants) plus SEP could be an acceptable intermediate. A perfectly fine way to get a commercial propellant market going really soon. But the current bottleneck is the lack of spacecraft and surface infrastructure, not launch vehicles. Even if we already had RLVs, SEP and cryogenic depots that might still be a show stopper. And then there's the problem of cosmic radiation and long term microgravity. I mentioned almost all of these things in my two above posts. Did you read them all? You didn't actually, although you certainly covered many of the bases and I agree with most of what you said. Why do you ask? Because I edited after you saw my original post, and the edit addressed many of the things you said. Nevermind. It isn't the laws of physics that would stop this from happening. However, assuming 'get to Mars' means with people, then probably not with the existing budget. It is the Mars spacecraft which appear unaffordable. Note the caviat that the Micro-Space paradigm (stripped down craft with fairly high risk of catastrophic failure - like climbing Mt Everest) might be affordable but would be an impossible political sell for NASA to pursue. Quite right. With the microspace concept, we already have everything needed and proven (well, once MSL gets there) for a one-way trip. But large spacecraft don't automatically mean safer, either. The Mars mission concepts which rely on Battlestar Galactica spacecraft will never, ever go anywhere. Is a crew of 6 or 8 necessary? Really? Why not 4? It seems to me that the split between 4 and 6 is somewhat arbitrary, but sticking with the larger number makes the mission that much more expensive (especially since it pushes the EDL requirements further and further from our actual experience with unmanned Martian EDL). And why is NTR chosen, which has absolutely no in-flight experience and only slight performance improvement over hydrolox for the most realistic designs (though PLENTY of internet fanbois!)? Why not something with actual flight experience like solar-electric? Or even just chemical with on-orbit refueling and multiple rendezvous (though the mission may be longer, the surface money time would be much longer as well)? Manned Mars missions have suffered from Battlestar Galactica architectures for far too long. Apollo was a monumental effort with a level of funding far beyond NASA's today, yet its spacecraft were very lightweight and paired-down (especially the lander!). The only hope we have for a manned Mars mission in our lifetimes is to look very hard at the actual minimum requirements, like Apollo did. Same applies to a mission to the Moon, too, actually. EDIT:It seems that long-stay Conjunction-class missions are already recommended in Mars DRA 5.0, which means that all-chemical propulsion is doable. I really like the idea in Mars DRA 5 of pre-deploying parts of the architecture. This concept is definitely necessary, and needs to be actually expanded, with pre-deployed assets in LEO, EML1/2, LMO, and Martian surface. And why is NTR chosen, which has absolutely no in-flight experience and only slight performance improvement over hydrolox for the most realistic designs (though PLENTY of internet fanbois!)? This slight performance is actually a doubling of the specific impulse. The rocket equation should do the trick in explaining why this is so much better. That applies to electric propulsion too. And IMLEO is only part of the information you need to estimate costs. If you can reduce launch prices per kg by an order of magnitude then that can have much of an influence as reducing IMLEO. More actually, because it would allow for the emergence of a new sector of the economy, commercial manned spaceflight, something NTR wouldn't do. I agree, but I adressed the point he made about NTR being just slightly better than hydrolox. Also, if you don't want huge spaceships going to mars, you're going to have to find another fuel, because the best chemical fuels will result in huge amounts of fuel. Besides, NTR might someday get a T/W of more than 1, whilst electric propulsion wouldn't. This would result in NTR being potentially more usefull in reducing launchcosts. Well, depending on the T/W it might be. See Using Payload Fraction Expressions in an Example on Jon Goff's blog. I'm not as convinced NTR is a bad idea as Kirk Sorensen is, at least not for all scenarios, but at least it isn't obviously a game changer. Agreed. Huntress et al proposed using SEP for cargo and propellant and chemical propulsion for crew. But I'm not convinced there are near to medium term solutions that do not involve huge and / or very heavy spacecraft. And that would mean there are no plausible near to medium term solutions at all, except perhaps in combination with cheap lift, i.e. cheaper by an order of magnitude. You don't necessarily need high T/W if you use very low thrust and very high Isp. NEP is a serious candidate. Kirk Sorensen believes it to be the main candidate. He may well be right. But personally I believe cheap lift is the key and that might be served better by high IMLEO soon rather than low IMLEO far in the future. Can we get to Mars with existing rockets? No HLV? No NTR, no nuclear-electric, only chemical or (perhaps) solar-electric? 1) On-orbit refueling is required (or many disposable stages... not necessary when orbital refueling is demonstrated on ISS). 3) Transit hab mass should be around the Salyut mass or less (less than 20mT, whereas Mars DRA 5 assumed over 40mT). 4) Consider a spacecraft lighter than the full 21+mT Orion (though the "Mars block" Orion service module would likely be lighter since only 300m/s is needed right at the end). Orion has a lot of capability, but most of those capabilities don't need to be hauled all the way to LMO and back when you're using it just at the end (perhaps could dock with the MTV using an Orion at L1/2, but leave the Orion behind at L1/2 and use a lighter capsule for the Earth reentry). A small capsule of less than half the mass of Orion would likely be adequate for the 300m/s necessary right before Earth reentry. 5) Consider Advanced ASRG/solar hybrid surface power to avoid the need to develop a space fission reactor. Adding "fission" to any architecture component means endless headaches and billions of dollars of development and large capital outlays for new facilities. Avoid fission as much as possible unless shown to be demonstrably less expensive. Also, because of the uniquely low radiation shielding requirements of Pu-238, the power source could be co-located with the crew. Because it draws on existing technology routinely used for unmanned outer planets missions, political support is more likely and requires only an expansion of existing assets instead of all-new nuclear facilities (which are, unfortunately, infamous for long, drawn-out delays). 6) Separate the hab from the lander. Make surface components small and lightweight, under 3 tons (thus putting it within range of existing Martian EDL with larger fairings and Skycrane upgrades... also within range of single-shot Heavy-EELV-class launch vehicle performance). Consider making all components mobile to avoid needing precision EDL (though a compromise between mobile elements and EDL precision makes sense... perhaps a remotely operated rover like ATHLETE could move elements to a central location after they land). Using SEP tugs (or perhaps small, disposable SEP stages like are planned for some unmanned outer planets missions) would enable smaller and cheaper (Falcon 9 or Atlas V 402) launch vehicles to deliver these packages or multiple packages to be delivered with one launch. This sort of low-footprint logistical support could also allow a permanent manned presence on Mars if combined with advanced ISRU and closed-loop life support (this is probably one of the only ways to get a bang-for-your-buck similar to robotic missions). If we do this right from the start, then mission costs can be far less and we could send people to Mars rather sooner. 7) In the absence of new, very intriguing findings at high elevations, assume a relatively low elevation landing site to make EDL easier and astronaut radiation doses lower. 8) Carbon monoxide/LOx rockets are an enabler for Martian ISRU rockets requiring no feedstocks from Earth. This is a game-changer. Demonstrate CO/LOx ISRU and rocket technology on a Mars sample return mission (also a good opportunity to demonstrate a 7m diameter heatshield and large EELV fairing and upgraded Skycrane descent stage with bipropellant rockets, perhaps also making use of a prototype propellant depot and LMO rendezvous... expensive, but essentially demonstrates almost all the needed steps). 9) For God's sake, what's the point in doing a manned mission to Mars if we're going to keep the astronauts from any of the interesting places? Are we going to let Planetary Protection keep us from doing anything interesting??? Might as well close up NASA's manned and unmanned exploration missions and just use telescopes! Using all-chemical with on-orbit refueling (or perhaps multiple launches of 25mT hydrolox stages bolted together in orbit... too bad we don't have extensive on-orbit assembly experience with a sort of international station in space...) means an HLV isn't required, since the dry mass of a chemical stage is almost always less than the dry mass of a nuclear stage. Put the billions and billions of dollars we would spend on an HLV into launching thousands of tons of propellant on non-HLVs. BTW, I'm glad I put that little quip in there about NTR fanbois... All sorts of passion (which I once had for NTR, before I learned the facts and did the calculations) and waving around a 900s Isp about an engine that doesn't exist and has NEVER flown in orbit (not even once!). The hydrogen tanks for such a NTR would dwarf the equivalent propellant tanks for an equivalent hydrolox stage. On-orbit refueling (with relatively inexpensive propellant) means that dry mass (roughly proportional to tank size) is the most important measure of spacecraft cost. Even if a drop in price never happens (and it will, especially if we use on-orbit refueling or almost any non-HLV architecture with a high flight-rate), on-orbit refueling is still superior. You can upgrade to SEP (or NTR or NEP, if they really are cheaper and better) at your leisure. IMLEO alone isn't a good measure of overall system costs when comparing architectures. The billions needed for development of an HLV and NTR would absolutely dwarf the costs of just doing it with orbital refueling. NTR is useful when your on mars. A nuclear hopper would allow you too visit 10 sites instead of one. You could also ascend to lmo with it at the end of the mission. People are the most advanced robots. Hi Chris! You've made this comment before, as have many others. I don't mean to pick on you, but in combination with your signature line responding to this is almost irresistible! Either way, it might be best to ask, "Upon what research does NASA depend when setting this minimum crew size for long duration spaceflight missions?" An interesting note: Cady Coleman, currently resident aboard ISS, has in the past been the lead astronaut for long term habitability issues. Maybe some journalist with the appropriate opportunity could ask her the question? Getting back to the "people are not just robots" observation, and taking it a step further: when we think of robots, we don't tend to think of interpersonal dynamics. But with people, that's kind of necessary! For long duration spaceflight, NASA is committed to keeping each crew member both physically and emotionally healthy so he or she can perform optimally when the mission reaches its destination. But individual emotional health is tightly linked to group emotional health. Surely NASA must also be committed to keeping the crew functioning optimally as a team! Back on robots again: although we may imagine them to have gender, we don't usually think of them as having (ahem) gender-related preferences. But we expect people will, and these notions of gender and gender-related interactions are an integral part of interpersonal dynamics, and thus an integral part of keeping a crew functioning as a healthy team. N.B. : Don't be misled by the military model into thinking that a unisex crew can necessarily avoid this. That's (again ahem) making some assumptions about gender preferences. NASA isn't guessing blindly about crew sizes. There are lots of crews that aren't aboard spaceships! There have been quite a few NEEMO missions to the 'Aquarius' habitat, for example. All have been four person crews. Please forgive this somewhat long-winded and possibly off-topic-leading post. I'm just wondering: "Why do people assume a crew of four for a Mars-duration mission is feasible?" Yes. First reach EML-2, stack a two-men Phobos expedition from there. Once at Phobos, land on Mars using current EDL system - I mean, land a Mercury capsule on the surface. We'd need to have an ACES-type upper stage that requires only LOX and LH2 (no helium, nitrogen, hydrazine, etc.) and is self-powered either by fuel cells or solar cells, and we'd need propellant depots in LEO, EML2, and LMO. So not with existing launch vehicles, but ACES makes a huge difference. We'd want to do a fully propulsive EDL rather than requiring a large-diameter heatshield for each landed payload. That's why the LMO depot is necessary. Then of course we need a modified ACES that burns LCH4 or a mixture of LCH4/CO to serve as the ascent stage, but it also has to land with residual LH2 (suggesting that it would also burn LH2 for EDL) and either carry an onboard ISRU plant or preferably interface with a separately-landed ISRU rover. This is probably the most difficult piece of the architecture. If the ascent stage can't land on hydrolox and ascend on ISRU fuel, then the architecture begins to fall apart. We don't want to include LCH4 in the depot architecture, we don't want to push a tank full of LCH4 at the way to LMO, and we don't want to use a separate EDL stage to land the ascent stack. ACES isn't necessary, nor is the absence of hydrazine, nitrogen and helium. I think it would be unwise to do manned Mars missions before we had ACES, and highly unlikely too, but it isn't necessary. And to the degree ACES is desirable, it is mostly because of the desire for a larger departure stage, not so much a larger launch vehicle. Getting rid of hydrazine would be nice, but not at all crucial. Why would you want to get rid of helium and nitrogen? I agree with the need for refueling in LEO and LMO and at EML2 and I would add refueling at a Mars Lagrange point too. It's much more efficient to have a reusable heavy MTV cycle between the Lagrange points of the Earth (or moon) and Mars than to have it ascending and descending both gravity wells repeatedly. Propellant can also be prepositioned to LMO and SML1/2 by SEP. I agree about the desirability of a LMO depot (preferably fueled with ISRU from phobos). And also about the need to do the landing partially propulsive. But going fully propulsive is not necessary. A relatively small heat shield that fits into an EELV payload fairing can get you down from LMO velocity to 1000m/s. That's 3.1km/s less than a fully propulsive descent. If you have a heat shield you can also do aerocapture and aerobraking, which saves you another 2.7km/s. Why? By the time the mars direct architecture was invented there was still a large degree of uncertainity about water on mars. But as we know now there is plenty of water on mars. So why not just stay with LH2/LOX for the ascent stage? A LH2/LOX lander/ascent stage could be "self-ferrying" to mars: launch to LEO, refuel at LEO depot, go to EML2, refuel there, to to TMI, aerocapture and aerobrake into LMO (phobos). Refuel there and land. Because if the stage requires helium and/or nitrogen (for tank pressurization, engine start, purges, etc.) or some separate fuel for electrical power, then those consumables have to be replenished along with the propellants at the depots or preloaded at launch for the required number of refills/restarts. If the propellants are the only consumables, then it's much easier to operate the propulsion stage between several depots. By the time the mars direct architecture was invented there was still a large degree of uncertainity about water on mars. But as we know now there is plenty of water on mars. So why not just stay with LH2/LOX for the ascent stage? You may be right, but we'd need a number of robotic precursors to perfect that approach at the chosen landing site, because mining water ice is a lot trickier and more location-specific than processing the atmosphere. We need to have the right digging hardware and be able to remove rocks and sediments from the water, etc. But if we can master that, then it definitely has compelling advantages over the Sabatier process. I agree that we would need some precursor missions for mining water ice, especially if this has to be automated. Maybe the easiest way for mining water ice is to heat the ice using microwaves and condense the resulting water vapor. It is very energy inefficient compared to digging it out and melting it, but you need a fairly large power source anyway for the electrolysis. You would also need a precursor mission to demonstrate aerocapture and aerobraking. But that is still some time off. First we need propellant depots. Thanks, So it seems we can do these things, but some in Nasa want's a big heavy lift vehicle to the expense of testing technology which would get us there and use existing materials on the surface for fuel, water, and oxygen. Another thing I have noticed is if we just started moving, the ELV's would evolve into their larger heavier brothers probably without a lot of expense from Nasa. Another thing I have noticed is if we just started moving, the ELV's would evolve into their larger heavier brothers probably without a lot of expense from Nasa. If nasa would buy a large number of the heaviest currently available rockets (Atlas V 551 and Delta IV heavy), that would probably be a good incentive for ULA to develop ACES. But why should ULA develop ACES if even the current largest versions of the EELV are not in high demand? I know that 6 crew would be nice to have. I know that studies have been done on the topic. I've read about it some, and I just don't find the argument very convincing. We know that only 2 crew probably isn't enough because on ISS, two crew is just enough to take care of maintenance with not a lot of time left for science (on the other hand, Apollo seemed to work with only two crew on the surface, though for a shorter length of time). It's an interesting question, but I don't think we know the answer, so we shouldn't limit ourselves to only architectures with 6 or more crew. We may not be able to afford 6 crew. I think they chose 6 with an idea of using 3 husband-wife teams. It is a long way to Mars and back. I see the following needs. 1) Nuclear or Solar electric engines to speed trip to and from Mars. 2) Mars robotic probes and robotic equipment to find and use Mar's water ice and/or atmosphere for fuel and oxygen production prior to landing. 3) a space station at L1 or L2 for fuel depot and assembly point for Mars craft and Lunar craft. If we don't use item 1) then a spacecraft would need to have artificial gravity. In what way do you think Kirk Sorensen is too pessimistic about NTR? I find his argument fairly convincing as long as we're talking about minimum-delta-V missions. If one were to fly a fast mission, then the low thrust-to-weight ratio of NTR ceases to be such a problem. And, of course, as any NTR enthusiast will tell you, if much higher thrust-to-weight ratios than what has been demonstrated thus far were available, NTR would look attractive even for minimum-delta-V missions. I'm not saying he is too optimistic, just that there may be scenarios in which it makes sense. Or not. He hasn't conclusively shown there aren't. If EDL limits us to 2 people per lander we can simply use 2 or 3 landers. A mass/heatshield trade off. I read the paper, but I still think that the notion that we can only land 2 tons on mars is wrong. It is based on scaling up existing EDL concepts that were not limited by payload fairing size. There is a large number of concepts that would allow much larger landed sizes. Obviously, none of them has the technology readiness level to immediately use them for a manned mars mission. Hydrogen and to a lesser degree oxygen are the hard part, the others are much easier. I can see why you might want to get rid of hydrazine as it is nasty stuff (although spacecraft designers seem to be in no great hurry), but helium, nitrogen or propellant for electrical propulsion are easy. I think prohibitive is overstating the case. If you use electrical propulsion to transport the propellant, then getting it to LMO is not spectacularly more expensive than getting it to LLO. And delta-v for a moon round trip is comparable to propulsive descent on Mars. Expensive yes, but not necessarily prohibitive. You are right. It is very expensive, but not prohibitive. But I guess I just don't see the point. Mars does have an atmosphere, and while it might not be sufficient to get a heavy lander to subsonic speeds, you can still let significant deceleration work out of it. Agreed. Fully propulsive landings are mainly useful as a reference point to compare other solutions with. It's what we could do if we had to land a heavy payload on Mars in a hurry. Or one thing we could do if we wanted to stimulate development of cheap commercial lift by buying lots of propellant in orbit. Radiation. Crew. Long pole in the tent. Note that this is below 500 mSv annual limit to the blood-forming organs set by the NCRP (intended to limit the risk of cancer to an acceptable level). This compares to about 260 mSv for the background radiation of parts of Ramsar, Iran. So, the annual dosage isn't far beyond what can be very well tolerated by humans on Earth. 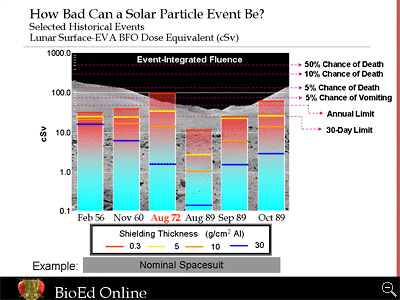 What about acute radiation from solar particle events? In other words, as long as the astronauts are inside a spacecraft and not just in a spacesuit, even an exceptionally intense solar particle event stays well below even a significant chance of vomiting, let alone a significant chance of death--note the vertical scale is logarithmic. And by retreating to a well-shielded shelter during solar particle events--which are forecastable--astronauts can significantly reduce their total mission dose... simply being between the water (or propellant) tank and the Sun would work for these events (though it's a little more complicated than that because the radiation can be directed via the solar magnetic field, but that works to a zeroth order guess). A Bigelow-type module for such a trip would easily have at least the equivalent radiation protection as 30 grams/cm^2 of Aluminum (the blue line in that graph) (especially if you took refuge in the core). And if you can shield against solar radiation to the extent it becomes negligible (by using an inflatable style module and placing supplies between the crew and the Sun) compared to cosmic rays, arranging the trip during solar maximum would mean (because of the stronger solar magnetic field repulsing galactic radiation) an even lower total radiation dose. And this is all without even touching any drugs or other treatments which can possibly reduce the effects of both long-term and acute exposure (there are some drugs that are especially promising for acute exposure). I think the radiation on the surrace could be solved with simple excavation technology. Not to long ago NASA partnered with Caterpiller in order to create a lunar construction truck that would be remotely controlled. What you could do is essentially use dirt from the landing site to create a very effective and rather inexpensive shield against all types of radiation and micrometorities. Sand and dirt on Earth has a halving thinkness of about 3.5 inches. Assuming the sand on Mars and the Moon has similiar properities very effective radiation shielding is possible. Radiation on the surface isn't really a problem. Folks in Ramsar, Iran get more radiation than that, and they're healthy. But, as you said, you have lots of shielding material readily available. The easiest way to do it would be a small shovel (which you'd already probably have for scientific uses) and a whole bunch of bags to shovel Martian soil into. Place the sandbags on top of your hab, and voila! Radiation dosage, already low, is halved. I suppose you could just heap dirt up there without even any bags, if it was flat. Anyway, radiation on the Martian surface is not a problem (as long as you aren't on Olympus Mons). It has options all the way to 70T existing tooling and 100T with tooling changes. Looking at the changes 40T out of the D4H should be low hanging fruit well within budget if there is no SDLV. Actually with no SDLV even the more insane EELV upgrades likely could be afforded with money left over for Falcon X. Also F9-H with Raptor should have an IMLEO payload in excess of 40,000Kg. Look I here you and I think your right, but it is NASA we are talking about here. The thing about radiation is that too much radiation will kill you fast, but small amounts of radiation over time will put you at risk for cancer. I highly doubt that NASA is going to take significant risks with radiation. The risks of radiation exposure are not greater than the other risks of spaceflight.